It will be no surprise to you that I like cute things. Tiny shoes, pretty dresses, lovely dolls. I love them all. I recently took the time to actually change the outfits (!) on a couple of my dolls to give them some love. 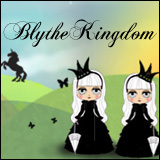 I find that often times when I get into ‘busy times’ I neglect my dolls on a regular basis. This isn’t done on purpose nor with malice. When I was in school, this happened because it was because of midterms, papers, projects, clinical, or finals (so basically whenever I was in school and should have been studying). Now that I’m working, it’s because I work a lot, pick up shifts, and during my relatively rare downtime, I wind up making plans to be out of the house because I don’t want to spend what precious time I have off from work cooped up indoors. 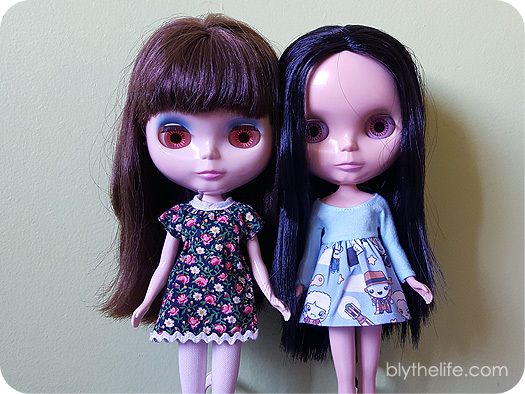 But for me, Blythe is a primarily solo indoor activity when I’m not attending a doll meet – so by making plans to be out and about, this generally, means less dolly time. And I really like dolly time. So, I made some time to redress some dolls. 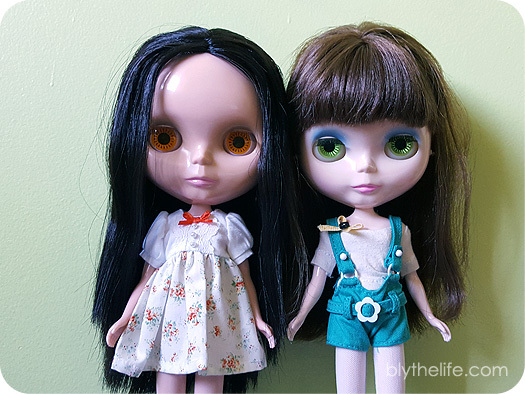 Not all of my dolls get neglected – often times Prim will get an outfit change, and so will Eden. I play favourites, what can I say? And then I took some photos because pictures, or it didn’t happen. 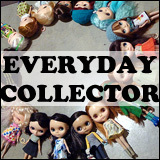 Do you fall into periods of doll neglect like I do? 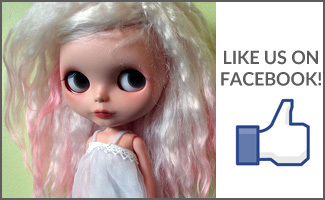 What makes you pick up the dolls and give them some attention again? Join the conversation below in the comments! Belarus’s wearing: dress/Puppy52Dolls (she was wearing dress/ericaduh). Kindred’s wearing: shirt/handmade (can’t remember maker), shorts/Nostalgic Pop stock (she was wearing dress/unknown vintage). For me dolly times are always times to calm down and focus on something I really, really like. There are times in my life when I am busy with work I have to neglect them too, but I try to redress them as often as possible. I love to pick clothes and outfits for them. Sometimes I just take a helmet and create an outfit around it and sometimes I look for a theme, like maybe: fairy tales, back to school or something else and try to combine clothes and heads in a way I didn’t use them before.